This pic shows Yogi Bhajan followers worshiping Bhajan and Hindu idols at Bhajan's death place! Yogi Bhajan's Sikh Dharma International has sent out the following invitation for Sikhs to attend a Khalsa Youth Camp in Yuba City. My idea is to attend and confront the Yogi Bhajan followers teaching this Camp with tough questions about why they have Hindu idols & huge tantric pictures of Yogi Bhajan adorning their Gurdwaras. I will present photos as you can see in the links which prove that Yogi Bhajan followers worship these images of Yogi Bhajan & Hindu idols along with performing tantric yoga and Hindu pujas! The perfect opportunity has developed where all Sikhs opposed to Yogi Bhajan’s agenda of subsuming Sikhi into Hinduism has presented itself this month when SikhNet directors & Bhajan’s followers will teach a “Khalsa Youth Camp” in Yuba City California USA. All Sikhs are invited to attend and ask Yogi Bhajan’s followers tuff questions about why they are misrepresenting Sikhi. Sikhs are also encouraged to video tape the discussion and post the film on Youtube so Sikhs around the world can see what SikhNet’s real agenda is. Contact Gursant Singh at 505 903 2675 or e-mail me at Gurusant@hotmail.com. If Sikhs need help financially for transportation to Yuba City or accomadations, please let me know and I'll make arrangements. Please see this video and facebook page for more info on the anti-Sikh practices of SikhNet & Yogi Bhajan's followers. 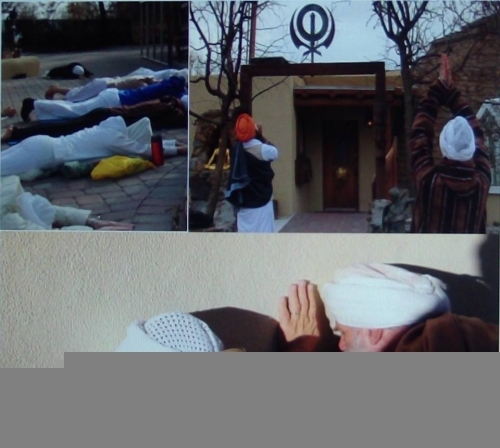 SikhNet secretly accepts $50,000 from Yogi Bhajan tantric / kundalini yoga cult organizations! Was Yogi Bhajan really a Hindu at heart? Yogi Bhajan given Hindu last rites! Did SikhNet know?